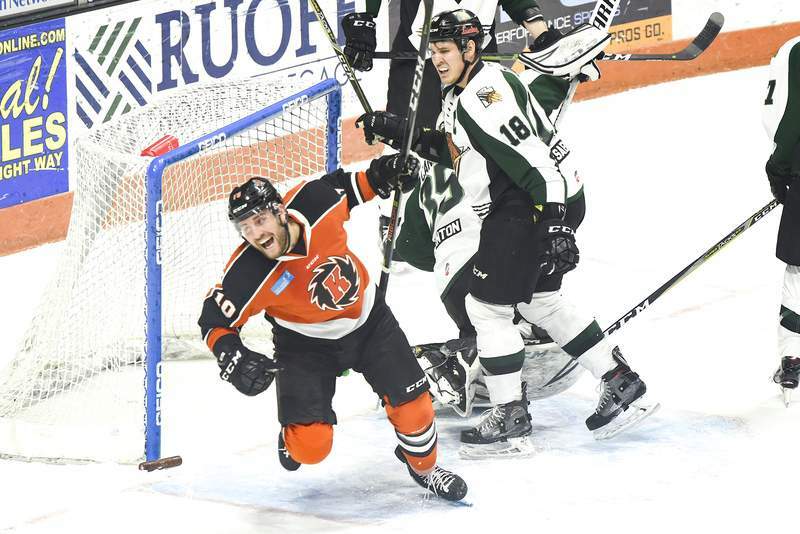 Brett Luke | The Journal Gazette The Komets’ Brady Shaw turns and cheers after a goal by teammate J.C. Campagna during the first period Saturday night at the Coliseum against Utah. 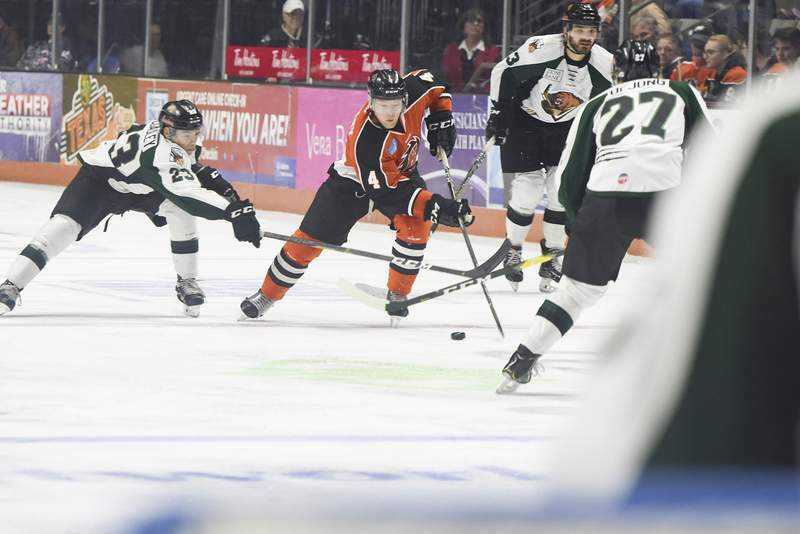 The Komets are riding a five-game winning streak -- tied for their longest of the season -- thanks to their 6-4 victory over the Mountain Division-leading Utah Grizzlies tonight at Memorial Coliseum. 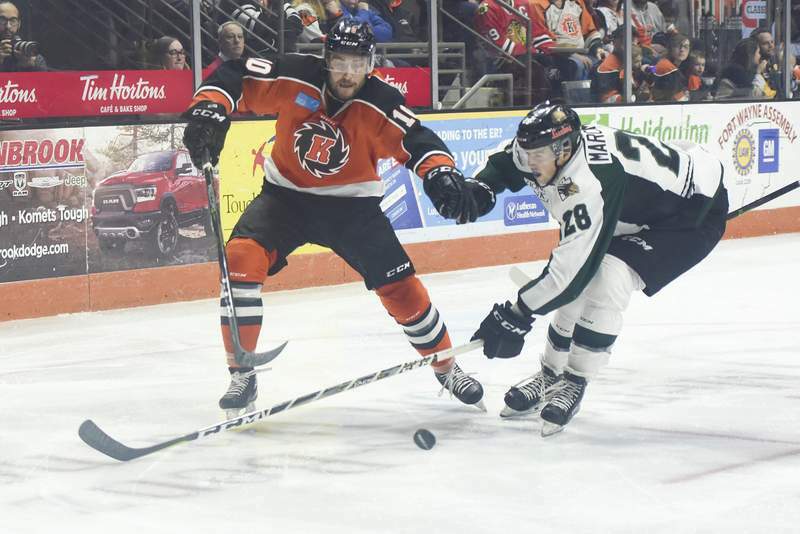 Marco Roy had a goal and three points for the Komets. 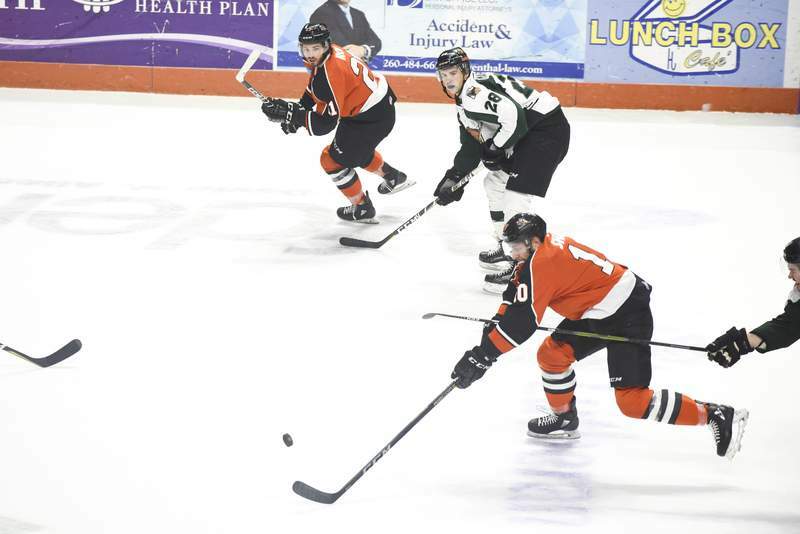 Jake Kamrass had a goal, giving him a least one point in 13 of the last 15 games, totaling six goals and 17 points along the way. 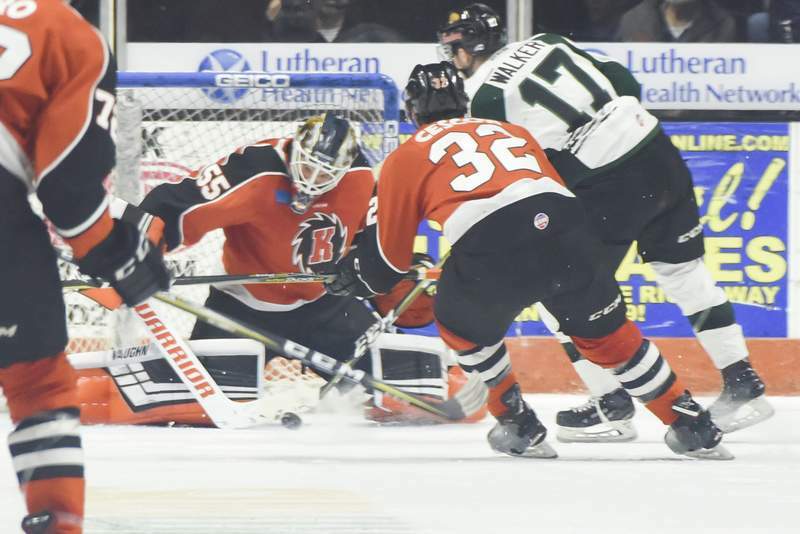 Joe Cannata stopped 25 shots for the Grizzlies. Lukas Hafner, who I wonder if will start three games in three days on Sunday, stopped 29 for Fort Wayne. 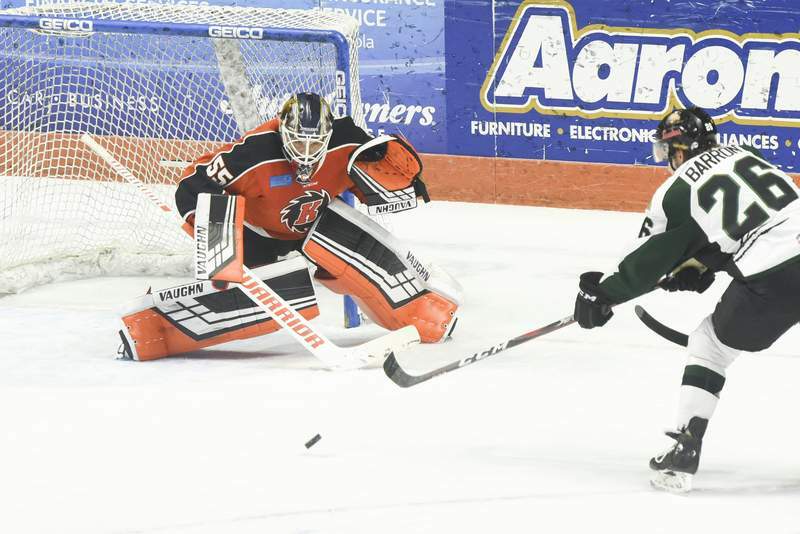 Speaking of that third game, a 5 p.m. game Sunday at Memorial Coliseum against the Kalamazoo Wings, coach Gary Graham, whose team has struggled all season with inconsistency, said this will be a major test. Fort Wayne is 3-3-0 against the Wings this season. At the Coliseum, it's 2-2-0. While Justin Hodgman is being called day-to-day with his hand injury suffered from punching Zach Miskovic's forehead, I don't see him playing Sunday. OK, speaking of Friday's game. 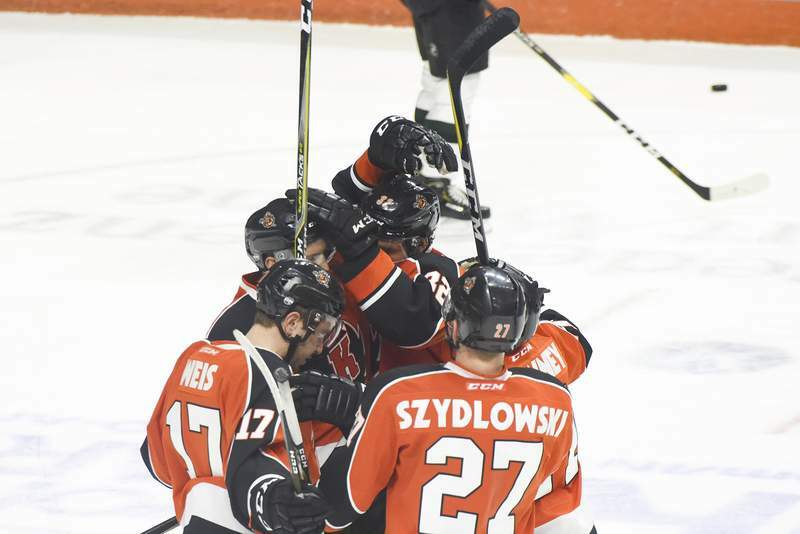 I simply don't get what the ECHL did today with the punishment from the Komets' 3-2 overtime victory over the Fuel. I would have given Taylor Crunk three games, but I have no complaint with disciplinarian Joe Ernst going four games under Crunk being a "repeat offender." In short, I get it. However, and I cannot stress this enough, Radovan Bondra escaping without even a fine when he was a repeat offender with two dangerous boarding calls -- within the same game -- is nothing short of mind-boggling. Believe it or not, I'm usually in the same line of thinking with Ernst. 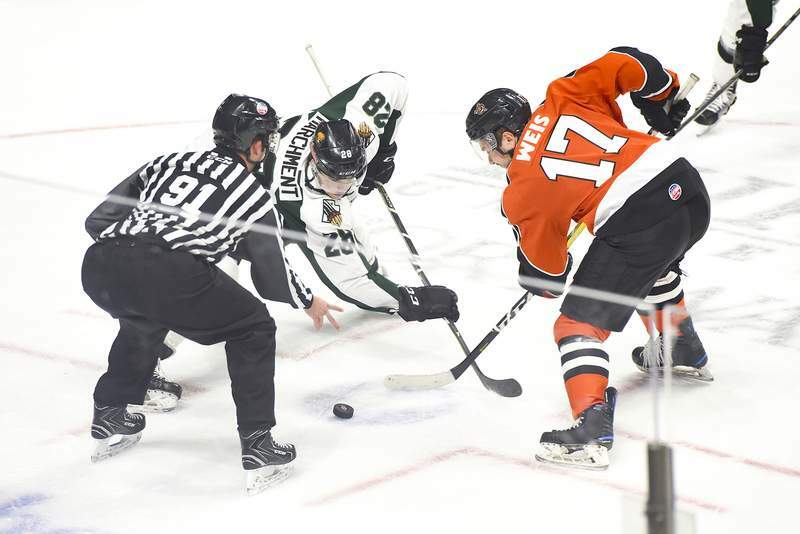 But the ECHL really missed the boat today, and an opportunity to send a message about dangerous hits. 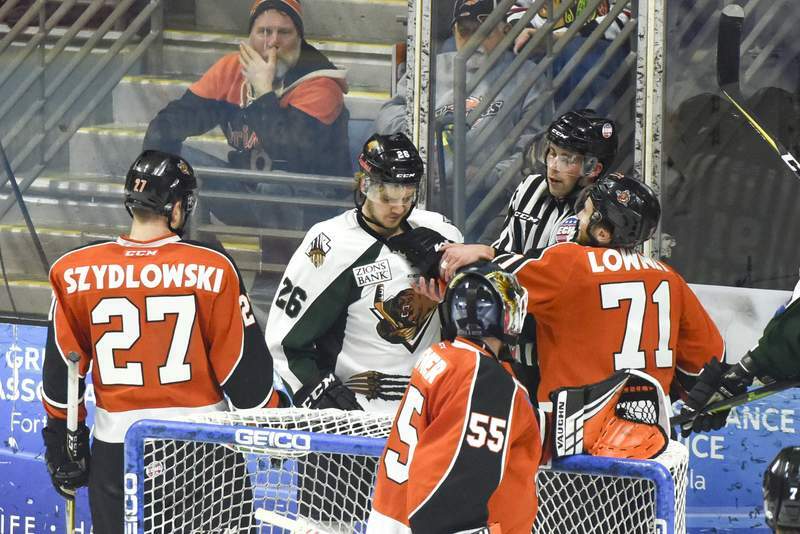 The Bondra hit on Kevin Gibson, who was crouching in a defenseless position and driven head-first into the boards, is absolutely the type of plays the ECHL should be more worried about than Crunk punching a guy at the bottom of the pile. Truly, think about it, which is more likely to be career ending? Again, suspending Crunk is fine. But nothing for Bondra? There's no defense for that. Yeah, I know he got a major for boarding Cody Sol and a minor for boarding Gibson, but the minor was not enough and -- again -- if we're sending a message about repeat offenders, this was an opportunity to do it especially since they took the time to actually fine Hodgman, a player who had no track record of offenses until the last two weeks and had gotten booted from Friday's game with a major and a misconduct. How do the punishments that Hodgman and Bondra got align? I just don't see it.